Lauren began her insurance career with Thomas Financial in 2004. Lauren is a Principal with the firm and is responsible for new business generation and cultivating the relationships of the firm’s second and third generation clients, especially those of family businesses. Lauren is a graduate of the Cox School of Business at Southern Methodist University where she serves on the Alumni Board and is a member of the President’s Associates and Dallas Hall Society. She earned her MBA from the University of Tampa where she serves on the Financial Ambassadors’ Council and is a member of the Legacy Society. Lauren holds her CLU® designation, considered the premier designation for insurance professionals, and is a registered CERTIFIED FINANCIAL PLANNERTM, identifying her as having met the high standards of competency and ethics established and enforced by CFP Board. Lauren maintains her FINRA Series 6 securities license and Florida 2-15 life and health insurance license. 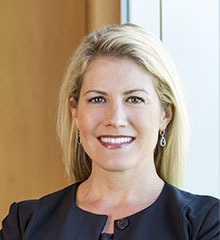 Lauren serves on the Synovus Bank Advisory Board and is a member of the Tampa Bay Estate Planning Council, Moffitt Cancer Center Merit Society and Million Dollar Round Table. She volunteers her time to the Tampa General Hospital Foundation and resides in Tampa with her husband and two beautiful children, Liam and Lola.